Indu Champati owns and runs The Bodhi Tree, a company dealing in commercial and residential real estate.In the past she has set up and successfully run a trendy restaurant in Bangalore, called Civet, for 5 years. Passionate about wildlife and nature, Indu has set up and managed two wildlife lodges (in Kabini and Bandipur) in the eco-tourism space. Each resort employs close to 65 – 70 locals. Employees are taught the nuances of House Keeping, Food & Beverage, Service and Production, Front Office, etc. and the concept of what a holiday for city folk is and why they need a holiday through organized training programmes. Employees also undergo spoken English classes. 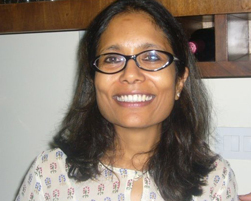 With her background in eco-tourism, Indu consults for Tata Coffee’s Plantation Trails in Coorg involving local people. Traveling around the world for wildlife, birding and nature is a passion — from the Arctic to Antarctica and the seven continents of the world to see wildlife, Indu has set foot on all seven continents. Another passion is the Kabini Foundation, an NGO set up in Kabini which works towards conservation of wildlife and nature with the involvement of locals. Each year, the foundation provides scholarships to 50 to 60 youth to pursue education beyond the 10th standard.